In the fall of 1948, businessman Freeman Wareham, manager and owner of Alberto Wareham Limited in Spencer’s Cove, Placentia Bay, decided he wanted something large – the bigger the boat, the more fish it would bring in. So he hired master shipwright Thomas J. Hodder of Creston North to build his schooner. As it turned out Alberto Wareham was the largest banking schooner ever built in Newfoundland and the last one built on the Burin Peninsula. Alberto Wareham, at 134 feet long and a little over 27 feet wide, weighed in at 243 gross ton. Nobody realized it at the time, but the railing along its sides were too high, making the launching of banking dories over the side very difficult. If prices for salt cod had been good, perhaps the sides could have been modified, but the chief reason Wareham took his banker out of the fishing industry and into the coasting trade was that the salt cod enterprise was ending. Up around Gibbons Pond and Round Pond were the big sticks of spruce and fir; the timbers in her frame were seven by seven. Local men cut the sticks and brought them to the shipbuilding site - at what was then called “Landing Place” and where Eunice Smith has his house now. George Gover ran a mill on the brook nearby and sawed the logs, making timbers and planks for the great schooner. 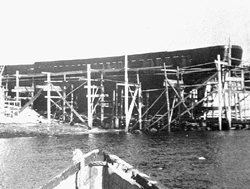 Much material, the decking, the sealing-up boards inside, came from a wrecked ship near St. Shotts. Freeman Wareham purchased this material and had it brought up on the schooner Lennie and Robert. In addition, the schooner was over-built and was 26 inches deeper than it should have been. The sealing-up was only three inches where it should have been four. Yet its size and shape were taken off the half-model and constructed quarter inch to the foot, but any fault in construction came from an overzealous owner, not the master shipwright. After the cradle was built and the keel laid, work went ahead in the spring and summer of 1949. Some of the men employed at building the Alberto Wareham were Bill and Tom Hodder (who were sons of master builder’s Thomas J. Hodder), Byron Hodder, Bernard Brake, all of Creston North. From Rock Harbour were Will Rob Hodder and Bob Hodder. Samuel Hooper, a World War One War veteran was with us too. Myself and Martin Hanrahan planked one side and did the rails and bulwarks. Gabe King and I went to Argentia on Alberto Wareham. At the American Navy dock a crane lifted the tanks and engine in and, when the Alberto Wareham was towed to Spencer’s Cove, Victor Butler fitted the gas intake, exhaust, mountings for the nineteen-ton 350 hp Atlas Imperial Diesel engine. Clyde Reid of Baine Harbour helped rig the new schooner and Charlie Boutcher from Kingwell and I installed the windlass. At Creston North, we were paid forty-three cents an hour building the schooner; at Spencer’s Cove, it was forty-eight cents an hour and found (food and lodging aboard the new schooner at no charge for the eighteen carpenters and fitters). “I carried my tool box aboard with me when she was launched. 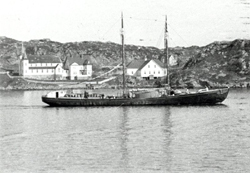 I intended to go from Spencer’s Cove to Burin dock to look for work,” Hayward remembers. On launch day, the great vessel slid down the ways as soon as the blocks were knocked out. It drifted across the Tickles and gently went aground in the mud and beach near Levi Hodder’s land. The largest fishing ship ever built in Newfoundland was ready to chase the cod. * On October 18, 2005, I visited Hayward Hodder - then in his ninety-first year - in his warm and comfortable living room in Creston North. He graciously took the time to recall his years as a shipbuilder, carpenter, and fisherman on many vessels. I found Mr. Hodder to be a reliable and a sincere storyteller – voices like his are rare. Not only did he recall his work on the Alberto Wareham, but told me he sailed with my father on the Grand Bank fishing schooner D. J. Thornhill in 1937. That meant a lot to me. ** Alberto Wareham’s twelve dories were probably built at Monksown, Placentia Bay, by the Holletts at Burin or the Martin family dory building business at Bull’s Cove. With that many dories the fishing schooner carried 24 fishermen, a captain, cook, kedgie and an engineer, totalling 28 crew. In the fall of 1949, Victor Butler, a gas and diesel engine fitter at Harbour Buffett and Spencer’s Cove, came to Creston North to install the tail shaft, all under water fittings, the engine bedding and designed the template for the fuel, oil and water tanks. These were constructed at E.F. Barnes Company, St. John’s. Born in Grand Bank on Newfoundland's historic South Coast, Robert C. Parsons already has a number of successful books published -- Lost at Sea Volume One, Lost at Sea Volume Two, Wake of the Schooners, Toll of the Sea: Stories from the Forgotten Coast, Vignettes of a Small Town, Survive the Savage Sea and Committed to the Deep: Stories and Memoirs.